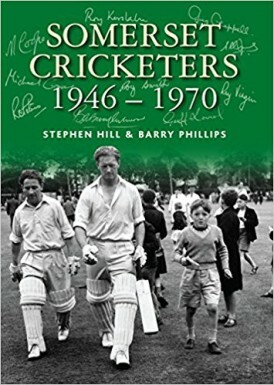 Having been hugely impressed by the first two volumes in this series, I was looking forward with some anticipation to the third instalment of Stephen Hill and Barry Phillips’ mission to produce a complete collection of biographical essays covering the men who appeared for the county between its First Class bow and the end of the twentieth century. Volume 1 covers the period 1882-1914, and Volume 2 the interwar years from 1919 to 1939. One change that quickly struck me this time is the number of men who, either before or after appearing for Somerset, appeared for other counties. As a Lancastrian I was particularly interested to learn more about Geoff ‘Chimpy’ Clayton who, despite the passage of time, seems not to have been rehabilitated in the affections of Lancashire supporters. Chimpy’s sin was to, together with his skipper Ken Grieves, go on a deliberate ‘go slow’ against Warwickshire in a Gillette Cup match in 1964 that cost his side any chance of victory – what sort of a man would do that? Hill and Phillips tell the story. Before Chimpy made the long trek from Manchester to Taunton I knew that all-rounder Geoff Lomax and off spinner Jim Hilton had made the same journey in search of opportunities that the Red Rose could not offer them. Neither quite made it, but it was interesting to learn something of two men who were only names to me before opening the book. What I hadn’t realised was that schoolmaster Tom Dickinson, who played a tiny part in Lancashire’s shared title with Surrey in 1950, had also turned out a few times for Somerset. Making the trip the other way in the 1960s was Yorkshireman Graham Atkinson, who was one of Lancashire’s opening batsman when I first took an interest in the game. Other multiple county men include the first man to appear for four different counties, pace bowler Alan Jones. Brian Lobb played for Warwickshire before arriving in Somerset and Derek Taylor started with Surrey. A man who moved away from Somerset was Haydn Sully, who joined Northamptonshire in the 1960s. A few years later he was followed by Roy Virgin, a class batsman who Somerset really should not have allowed to become unsettled in the way they did. Once again Test cricketers are few and far between and of those there are two are Australian. One is Colin McCool, who came here with the Invincibles in 1948 without playing in a Test and the other, by a distance the finest cricketer featured in the book, Greg Chappell. Two other overseas Test players are Khan Mohammad and Abbas Ali Baig. The only England men are Brian Rose, Fred Rumsey, Maurice Tremlett and Ken Palmer. Tom Cartwright also played for England, but not whilst at Somerset. The next volume of Somerset Cricketers, which will take the story to the dawn of the millennium, will contain some stellar names, and those will make it all the trickier to hold the reader’s interest – after all what can you say about the likes of Ian Botham, Joel Garner and Viv Richards et al in two or three pages that will hold your audience’s interest? I offered the thought in my review of Volume 2 of the series that keeping up the good work might prove trickier this time round, my reasoning being the much reduced number of amateurs popping in and out of the game whose cricket wasn’t good enough, but whose lives outside the game provided a steady stream of fascinating stories. That fear has proved totally groundless. Whilst there are not so many tales that could be described as bizarre, there are still plenty of interesting characters. One is Ian Lomax. Unrelated to namesake Geoff, and indeed his antithesis, Lomax was an Old Etonian who dropped in for half a dozen matches in 1962. It sounds like he was a complete ****, and it would be nice to be able to report that he made a fool of himself, but it has to be conceded that whilst he was clearly not a budding Bradman he did manage to perform well enough with the bat to justify his selection. Every single one of these profiles is well worth reading, although inevitably there are highlights. The aforementioned Chimpy is one, and David Hughes another. Hughes’story is an enjoyable one, and his testimony Exhibit A in the case against Ian Lomax, or perhaps I should say Mr I.R. Lomax. Ultimately it is impossible to select one favourite from over one hundred essays of such quality, but that of Jamaican quick bowler Vince Lindo is certainly one of the best. He only played once, and scored an unbeaten 23 and then took 8-88 in the only innings he bowled in – why did he never play again? The answer, of course, is within the book. Other interesting men with a total of 20 First Class matches between them are Philip Fussell (a crack shot), David Doughty (a life in the theatre) and Bill Dean (a somewhat slippery entrepreneur). Although Somerset Cricketers 1946-1970 is more than 10% larger than its predecessor the price is once more held at a penny under £17, reasonable in the extreme. Once again the book is an attractive hardback printed on good quality paper. Having access to the archives of the Somerset Cricket Museum is obviously an advantage, but a word or two about the photographs is essential. They are without exception a fine selection and are superbly reproduced. Quite outstanding is the one on the front cover of a young 1950s autograph hunter leaving the field hopefully with Maurice Tremlett and Harold Stephenson. Eyecatching for a different reason is that on page 27, a shot of the Somerset side walking out at Taunton to meet Bradman’s Invincibles in 1948. We know it was a time of austerity, and that many food items continued to be rationed. Nonetheless there were some very ample waistlines amongst that Somerset side. I did toy with the idea of giving both previous Volumes a five star rating, but held back just in case I was left with nowhere to go if the series got better. As my caution in that respect has proved wise, I will award 4.5 again but, realistically, books as good as this are always going to be few and far between and, certainly, no Somerset supporter should have any qualms at all about laying out their hard earned on Somerset Cricketers 1946-1970. Recent tradition demands that for the first week of a New Year the Review Section is devoted to an overview of recent and forthcoming releases, so here it is.